Deadline to apply to present your research will be February 24 by 5pm. The 2012 Symposium Application is open and we encourage undergraduates to sign up for a Symposium Info. Session and Abstract Writing Workshop (info. and registration below) to help prepare you for the event! Go to http://exp.uw.edu/urp/symp for application and information. Note: All UW undergraduates involved in research are encouraged to apply and those not yet involved in research will discover that attending, and volunteering with, the Symposium is a great way to learn about the broad range of opportunities available at the UW. Abstract Writing Workshops are tailored to students who are applying to the Annual Undergraduate Research Symposium. The abstract writing workshop includes information on what exactly is an abstract, how to write one, and what information to include. Questions? Contact the staff of the Undergraduate Research Program at urp@uw.edu. 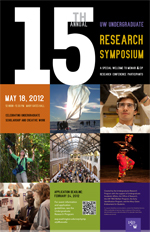 We look forward to having you join us for the 15th Annual UW Undergraduate Research Symposium!